Looking for someplace to enjoy surf & sand? Team All Spiffed Up’s location scout has you covered. Why not try a visit to Brethren Cove. The sim is filled with lots of great areas to lounge, entertain, and of course – pose. This beautiful dress is a free gift from LUXE Paris Fashion House for the Swank event. It comes in 5 standard sizes and supports Maitreya, Belleza, TMP, and Slink. You’ll have to hurry to get one for yourself, the Swank Event ends August 31st. A quick teleport to Firelight will result in several new hairdos. 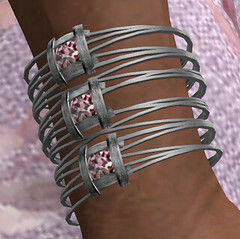 This style is one of three gifts for members of SFL&O (Second Life Frees & Offers). Joining the Firelight group will give access to mania boards and lucky chairs. Plus, Firelight is a participant in the Enchantment Hunt (it ends August 31st), so there are two 0L frogs to find containing cool new styles. If the sheer number of different hairstyles doesn’t peak your curiosity maybe this will: Most of the gifts we looked at came with a Color Tint HUD. Which is how our model Nina was able to concoct her lovely shade. Thanks Firelight we love your style! Wear your Free Dove tag to get these highly versatile earrings created by Poeme. They come in two shades, gold and silver. However, since they are copy/mod a quick switch into edit mode means you can recolor them to suit yourself which makes them a perfect accessory. A few clicks in the marketplace will finish off today’s look with these flirty suede heels. Brethren Cove – Scenic beach area with lots of interactive tropical displays freely available to all guests no group required. Swim, hot tub, host a dinner party, read, bar hop, BBQ, and the list goes on so grab your flip flops and it the teleports.